This striking contemporary Pendant design features a vibrant 3.45ct Queensland solid Boulder Opal. Accompanied by a wonderful characterful Broome White South Sea Circle Pearl. Together set in 9ct Yellow Gold and White Gold. 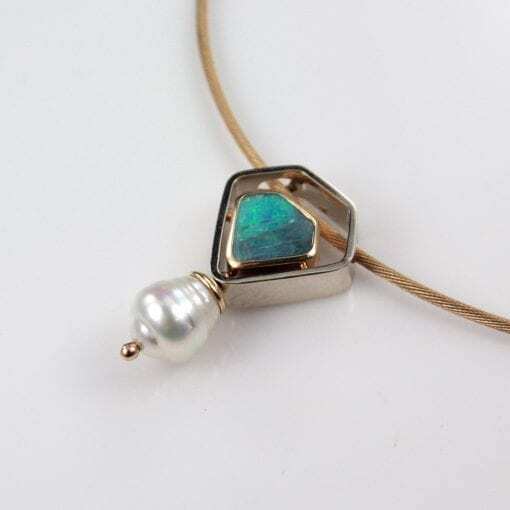 We have used a Bezel setting around the Opal to help highlight the clean flowing lines of this Opal and Pearl pendant. Renowned globally as the traditional birthstone of October. Boulder Opal interestingly comes a full array of colours, in the same stone – colours of the rainbow. Opal has a hardness of 5.5-6.5 on the Moh’s Scale of hardness. Known around the world, Opals are one of our nations gemstones, with this particular specimen coming from Queensland. Pearls have been a very influential gem throughout history and in today’s society. Some of the best quality and most famous pearls come from Broome in Western Australia. Pearls come in many different shapes, varieties, sizes and colours. Named ‘Circle Pearl’ after it’s characteristic circular pattern, created by nature no two pearls are the same. We love pearls for their ability to be worn with almost all outfits for every occasion. The properties Boulder Opal and South Sea Pearls, alongside the modern bezel settings and elegant design bespoke pendant ideal for both everyday wear and the finest of occasions. A salute to the fantastic natural wonders found in our great land the wonderful natural materials used to bring this pendant are 100% Australian. Designed and handmade in the beautiful Sunshine Coast Hinterland. This designer pendant is available for viewing in the comfort of our gallery in the heart of Montville, Sunshine Coast Hinterland.